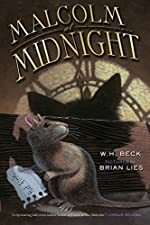 Review: Malcolm at Midnight is a story about a rat named Malcolm who is different from others due to his size. One day, when Mr. Binney came to the Pet Emporium and bought this small rat, Malcolm knew things were going to change. When school ends the "mouse" then meets the Midnight Academy including a series or other animals like a talking iguana that wear's the librarian's glasses after she leaves, "Honey Bunny", and a more. The bad thing is that rats have a bad reputation so when the iguana goes missing, Malcolm's the one to blame-but is he? I gave Malcolm at Midnight a five star review because the story itself was full of excitement and feelings that made me want to read on. Also, the plot was suspenseful with well developed ideas from when Malcolm got the school at McKenna all the way to the end. And the theme was an important message to me, that you should never judge a book by its cover due to the fact that the animals were stereotypical to Malcolm. Another thing is the characters from the evilness on the forth floor to the fish in the tank in the library, they were all multidimensional and well- rounded. Even though Oscar (one of the fish in the tank) is not in the story much, I knew what he was like. Lastly, the author's writing style was descriptive; I knew what the classroom looked like in Mr. Binney's class and what the inside of the skull felt like to Malcolm. It was also full of action because when I was reading I felt the book pulling me in as I was reading and when the description and action came together it felt like I was in the book. If you are deciding if you should read this book, I say you should because if you are a person who likes action and suspense then this is the book for you because this story contains that kind of plot with well devolved characters. Also I think this is a great book for teachers who are looking to read out loud. Review written by Caitlyn (6th grade student).